Is anyone else obsessed with activewear these days? We love seeing the new styles of activewear brands in the catalogues and, even more, having them in our hands. We started with one brand of sports bras: Anita Sports. From there, we have moved to more proper activewear brands, not only lingerie bras with sporty ranges. We have a little bit for every taste, with super stylish activewear styles for the pro yoggies and those runners who love wearing chic clothes when exercising. We also have inexpensive activewear brands for all of you who want something you wear to practise sports and wash right after. 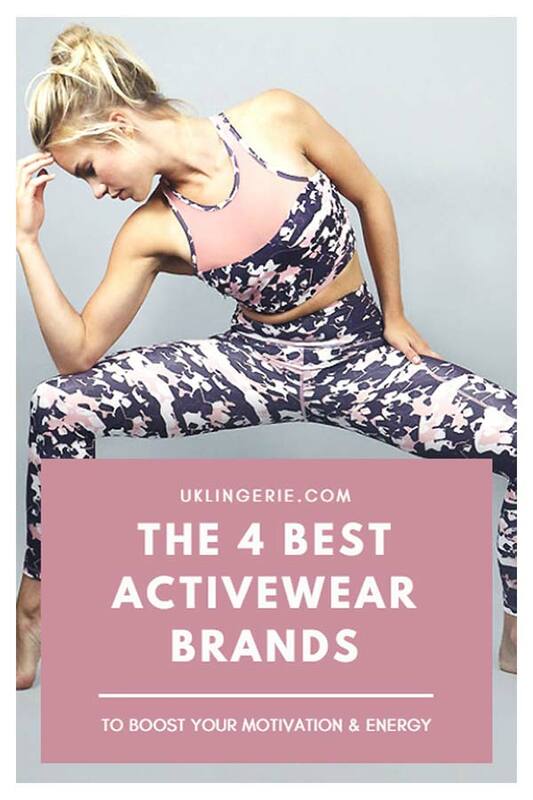 This guide of the top activewear brands for a motivation-boosting will save you time choosing the right activewear for you. Acai activewear is a brand we truly love. Not only its bralettes are yoga-approved, but also its leggings and tops are the cutest! We love the Acai backless vest on the left and, even more, the Spider-like black T-Shirt in the middle picture, also available in burgundy. We have matching leggings in two colours, which have been really popular. The Lole activewear brand is one of the top names in the industry. While it isn’t suitable for all budgets, it’s truly unique. Good quality, superb comfort and minimal-inspired design. If you want to look like a professional, this is the brand to go. The Lole’s abstract printed leggings in the picture above and this gorgeous pink tank are our best-selling styles in the range. Ambra is well known for its budget-friendly shapewear, but, for your information, Ambra activewear is really good for its price. Its little bralettes and leggings are the perfect activewear set for the busy women. You can get a 2 pair pack sports bralette and a couple of leggings you can wear, get changed, and put in the washing pile for the next day. We love Shock Absorber bras, but you already know that, right? Although the brand is well-known for its amazing sports bras, this is actually the first collection of Shock Absorber activewear. Many fans of Shock Absorber bras still may not know about its new activewear range, which is a bloggers’ favourite. We 100% recommend you give it a try! If you also want to take the chance to find out more about our brands of sports bras, you can always check out our recent post about the best sports bras out there or visit our site, where you’ll find all the information you need. What Shock Absorber Sports Bra Do You Need? ExOfficio Underwear, Is It Worth The Price Tag?